How many Christian people do you know, when asked when or how they gave their hearts to the Lord would say, “Well, life was great! I had a secure job that I LOVED. My wife and I were like two peas in a pod and my kids never acted out or got hurt. My car was running well and my dog was safe in the yard so I thought, now’s the time to come to Jesus.”? If that were the case than “Come-to-Jesus moments” would not be attached to negative (in earthly understanding) or difficult, soul-searching situations. If you become a necessity to someone else’s life, you are out of God’s will. WHAT!? I thought we were supposed to be showing people how GOOD God is and prevent them from difficulties. My wisdom tells me that by making everything comfortable I’ll “win” someone to God or “prove” to someone, that God is indeed good. But God does the opposite. He says, “In this world you WILL have tribulation.” Read Matthew 10:34, Jesus isn’t saying “I’ll relieve you from all strife,” He’s promising the opposite. Why? Because without pain on this earth we’d never know the Peace that passes all understanding. The peace in the midst of the storm. The knowledge that everything on this earth is temporary but we have an eternity of peace and joy ahead of us. If everything went well on this earth, we’d have no desire for anything different, better. Have you ever thought that when we, as Christians, step in to rescue someone from difficult, painful situations that we are actually stepping in the way of God?! That we are possibly robbing them from their need of God and causing them to become dependent on us instead? What I learned today and would like to suggest is this: Suffering is not the problem . . . rescuing someone from suffering is. 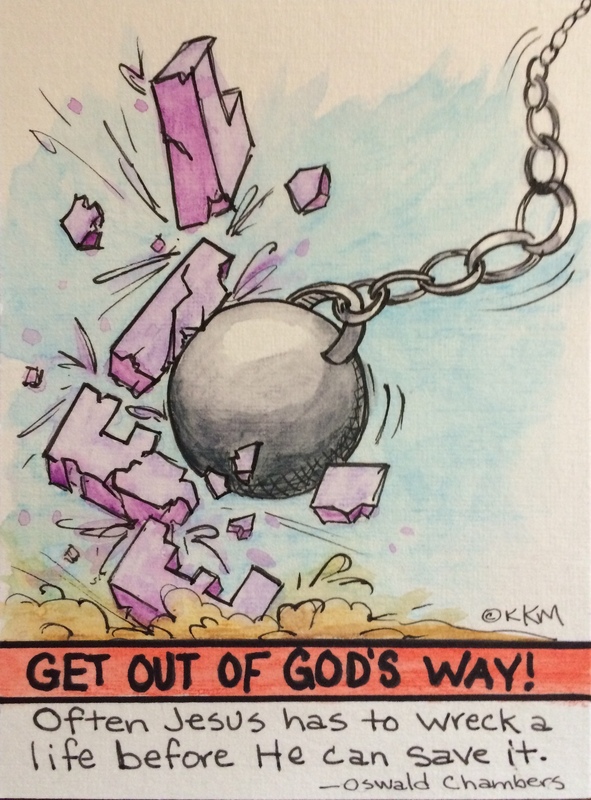 Step out of God’s way and let Him wreck and repair according to His wisdom. His repairs are eternal. Our job? Pray! ← Can a Baby Be Old?